Valentine's Day week is upon us, so I looked in the archives and found this fun post by Jennifer with suggestions about how to throw a Valentine's open house! Click here to read her post! Looking for a quick and easy button bracelet project? Try using one BIG button and some contrasting rubber tubing! 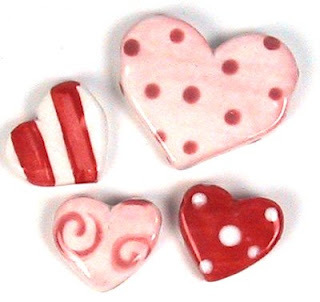 Polymer clay has come a long way, especially in this new book published by Interweave. Cyndi has lists of fabulous suppliers in all sorts of categories for jewelry makers and beaders. Do you have any faves you'd like to add? Maybe even yourself? Michelle shares a tip for writing beading project instructions. Carmi receives two different gifts at CHA that result in one very pretty necklace! This week Resin Crafts had a big post featuring bezels and components available at Michaels! Jean reviews the fabulous Jean Campbell's latest book, Creating Glamorous jewlery with Sawarovski Elements. You are SO going to want this great book! Wow!